Natura Pest Control is a pest control company located in the Reno/Sparks area in Nevada. The unique climate and sprawling urban development present the Natura team with a variety of pest control challenges. By their estimates, around 50% of their business is rodent related. The Reno/Sparks area can present an ideal breeding ground for pests. It's mild, temperate climate is especially comfortable for rodents. With urban development continuing, new neighborhoods are being built higher and higher into the hills. This has naturally displaced rodents throughout the community. Natura PC now estimates that around 50%, if not more of their calls are rodent related. Goodnature™ Traps are being deployed to offer Natura PC clients the latest in cutting-edge rodent control technology.
" I do remember vividly... watching the video on how the trap worked and thinking to myself - this is exactly what Natura needs!" With rodents being naturally displaced, no neighborhood was safe in the Reno/Sparks area. This created an in-flux of rodent activity in a large number of crawl spaces in local homes. This escalation of the crawl space invasions led the Natura PC team to search for a solution that would help them both identify rodent activity in the crawl spaces and effectively eradicate the problem. "The crawl spaces are pretty unique. You go into a crawl space that's on the bottom floor, and it can sometimes be 8 to 12 feet high. Then it'll sort of taper off to the contour of the hillside, to where the end of the crawl space, towards the front of the house, is maybe closer to a normal crawl space, you know, 2-3 ft high. In one case, we had identified 2 main entry points in this house, 1 in the garage on the west side of the house, coming in by the water heater. As well, as 1 on the other side of the house by the air conditioning unit. Both of those entry points led straight to the crawl space, and they were backed up to the hillside where there was no development behind them. They were exposed to the rest of the mountains that are behind them, so obviously, that population was already high, to begin with. They had been in there for quite a while. Even during the inspection, we could see them running on top of the stem walls and taking insulation out and building little nests with it. So, we put the bait that comes with the traps that you guys provide, and we started trailing that from outside all the way to the inside. There was a stem wall perfectly dividing that tall spot of the crawl space into the front of it, and we placed a trap on either end, screwed it straight into the stem wall, led that bait all the way up to it, and put in the CO2 and let it do its thing." Andrew and his team went back the next night and what they discovered surprised them all. It was a free-for-all that night, in total the Natura Pest Control team had eliminated 39 mice in total. To quote Andrew " It was just a big pile underneath the traps". Since then, Andrew and his team have continued to leverage the power of Goodnature™ Traps. He credits the traps consistency and ability to supply information to its users as extremely beneficial to his team. Check out our entire interview with Natura Pest Control available to read and listen to.
" 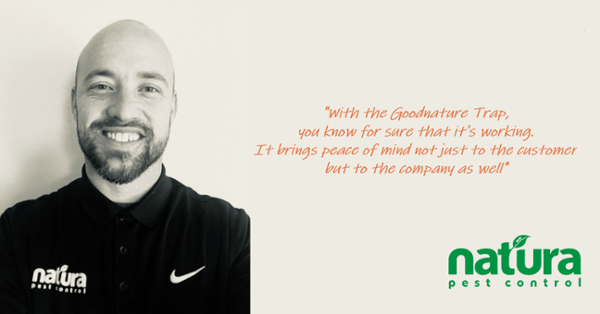 I feel like with the Goodnature™ Trap, you know for sure that it's working, and brings peace of mind not just to the customer but to the company as well. To know that you're using the latest and greatest. Instead of using a snap trap any customer could get at a store, we're using specialty equipment, and when using that with rodent knowledge, we have what makes control of pests a lot more successful."